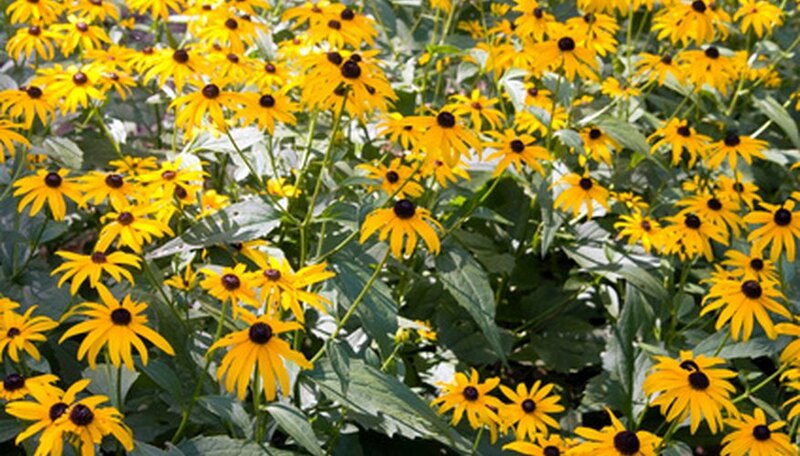 Black-eyed Susan, or rudbeckia, adds color to the garden with its deep yellow petals and black centers. Black-eyed Susans are perennial, so they return each year to grace your garden with their bright, upturned flowers. Starting them from seed indoors is an economical way to introduce them to your garden, or you can purchase healthy bedding plants from a garden center. Transplant the black-eyed Susan flowers out to the garden bed after all danger of frost has passed in spring. Set the black-eyed Susans outside in a protected area, such as a covered patio, one week prior to planting them in the garden. Leave them outside for two to three hours the first day, then gradually increase the time outdoors over the course of a week. This accustoms the plants to outdoor conditions and prevents shock. Prepare a well-draining flower bed in an area that receives full sunlight. Work a 2- to 3-inch layer of compost into the bed to improve drainage and add nutrients to the soil. Dig a planting hole for each black-eyed Susan. Dig the holes as deep and as wide as the nursery pot and space each hole 12 inches apart. Pull the pot off of each plant. Set the black-eyed Susan into a planting hole at the same depth it was planted at in its pot. Refill the hole with soil and lightly firm it around the plant with your hands. Water thoroughly after planting so any air pockets around the roots collapse. Water the plants once a week thereafter, providing at least 1 inch of water at a time. Black-eyed Susans readily self seed in the garden if you leave the flower heads in place after they wilt. Applying a layer of mulch around the plants helps preserve soil moisture and prevents weeds.